A new online toolkit shares tips and resources from Start Strong: Building Healthy Teen Relationships—the Robert Wood Johnson Foundation’s national program working to prevent teen dating violence and promote healthy relationships among middle-school-aged youth. 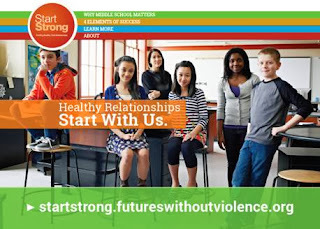 Supported by RWJF in collaboration with Blue Shield of California Foundation and Futures Without Violence, Start Strong targeted 11-to 14-year-olds in 11 communities across the country. Evaluation results show that Start Strong students reported decreased acceptance of teen dating violence and more positive attitudes toward gender equality—two key factors linked to stopping teen dating violence before it starts.